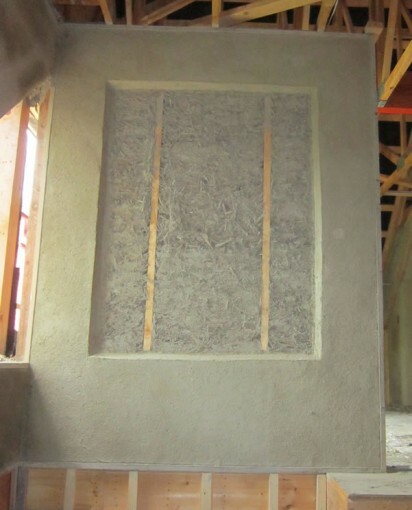 Here is a neat photo of the “truth window” for the clay/fibre walls of this building. It’s a large truth window, showing both the clay/fibre mixture and the internal framing of the wall. The truth window is located just above the stairwell, so anyone going upstairs in this building will see it at the top of the stairs. For those who can’t believe the inside of these walls are built from wood, clay soil, and woodchips — there is the proof! It’s a grey plaster, and on top of it will be a coat of coloured finish plaster.